One way to bring in audio to your Mevo is to plug in an external audio source via your mobile device's 3.5mm port, lightning port, or the USB port in a Mevo Boost. To bring audio in through your device's headphone port, you need a device that outputs audio via a 3.5mm TRRS plug or via a lightning plug (iOS devices only). The easiest example of what one looks like is your mobile device's supplied earbuds, most of which include a built-in microphone. If you look at the plug on these earbuds, you will see three thin rings in between four wider chrome rings, indicating the device can sent audio out in addition to receiving audio. If your 3.5mm plug does not have this appearance (i.e. only 2 rings), then your mobile device cannot receive audio from it. If your mobile device does not include a headphone port, use the headphone adapter that comes with it to attach a TRRS plug to your device. Additionally, some supported audio devices attach via lightning or USB. Be sure to review our supported external audio devices. Plug your external audio input into your mobile device. Once you have connected your Mevo to your app, open the main menu by tapping the More Options icon (•••) in the bottom right corner of the live edit view. The below menu will appear. Tap the microphone icon on the left side to open the Audio Mixer. Tap the mixer icon on the right side to see all audio sources coming into Mevo. You should see two sources listed here: Mevo and iPhone Microphone (it may say iPad or Phone, depending on the device you are using). To the right of each are mute buttons and audio level monitors. The Mevo source is the built-in microphone on the Mevo. The iPhone Microphone is the audio coming from the mobile device running the app or any devices plugged into it. If you want to hear audio from your plugged in audio source only, mute the Mevo source by tapping the corresponding microphone icon. The levels monitor will indicate that it's no longer outputting audio. 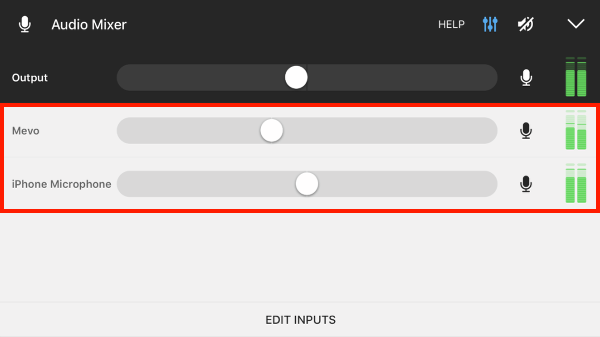 You can adjust your audio levels up and down with the slider bars in the audio mixer. Otherwise, you can control your audio device just as you would in any other production setup. When inputting a stereo signal into the iPhone through the 3.5mm TRRS input, the output will be a mono mix of the left and right audio channels. When inputting a stereo signal into the iPhone through the Lightning port or into a Mevo Boost via USB, the output will remain in stereo. When using an external audio source, you should mute your audio output on the app by tapping the speaker icon on the right side; this will help avoid an echo in your stream and recording. In this instance, we recommend pushing a test stream to your destination (e.g. stream to Facebook but select Only Me as the audience) and checking your audio quality there prior to your event.